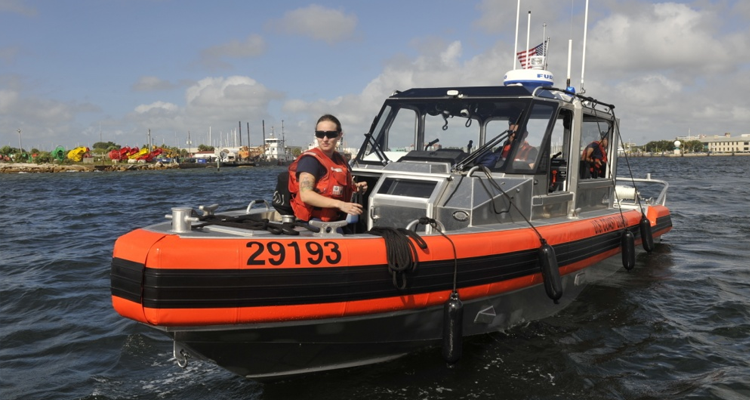 A boat crew from Coast Guard Station St. Petersburg, Florida, conducts training near the station on a new 29-foot response boat-small II Aug. 25, 2014. The Coast Guard placed a delivery order for 20 additional boats Jan. 12, 2018. U.S. Coast Guard photo by Seaman Meredith Manning. CG-9 reports that a contract has been let for 20 more 29 foot Response Boat, Small II. The Coast Guard placed a delivery order for 20 response boats-small II (RB-S IIs), worth approximately $8 million, with Metal Shark Aluminum Boats of Jeanerette, Louisiana, Jan. 12. The RB-S IIs will be delivered to Sector Buffalo, New York, this spring and summer. The 29-foot RB-S IIs can reach a top speed of over 40 knots and are used for a range of missions, including search and rescue, vessel boarding team deployment and law enforcement missions, port security, drug and migrant interdiction, and environmental response operations. This brings the total of RB-S IIs ordered to 322; 280 RB-S IIs have been delivered. That equates to $400,000 per boat. The initial 2011 contract was for 38 boats at a cost of $13M or approximately $342,105 each. That is about a 17% increase over 9 years. That’s probably not out of line. I have talked with several Coast Guard crew & coxswain’s and they really did not like the new Metal Shark boats, all thought the old RBS 25 ft from SafeBoats were much better, I also ask the Metal Shark people about this and they got quite defensive and a bit rude, their answer was something to the effect the CG “would get used to the new boats” – guess I am a bit old fashioned, for $400,000 seems it should not be something to get used to. This boat solved a bunch of problems that didn’t exist and created a slew of actual problems. It has a few nice features and would probably be good summer lake patrol boat. But all considered it is a POS. I talked to my local Coasties and they all stated that they hated the new boats, specifically because maintenance is different (lots of retraining) and that the new 29′ rides terribly in waves. They said that the 29′ will start getting very unstable in waves 2′ or higher, to the point where the crew sometimes starts vomiting (lol good thing the windows open…oh wait isn’t that another problem). “The Coast Guard placed a delivery order for seven response boats-small II (RB-S IIs), worth approximately $3.0 million, with Metal Shark Boats of Jeanerette, Louisiana, Sept. 26. The boats are targeted for delivery starting in spring 2019 and will be primarily stationed in the Seattle, Washington area. “The 29-foot RB-S IIs are replacing the 25-foot RB-S which is being phased out. The new boats can reach a top speed of over 40 knots and are used for a range of missions, including search and rescue, vessel boarding team deployment and law enforcement missions, port security, drug and migrant interdiction, and environmental response operations.